Making and drinking herbal chai together is a wonderful way to enjoy herbs with the whole family. After all what could be better than a big mug of sweetly-spiced steamy goodness on a chilly day? Chai is full of healthful herbs that aid digestion, warm the body, and gently boost the immune system. This recipe is caffeine-free and so is perfect for afternoon snack time or even in the evening before bed to gently stimulate digestion of the evening meal and help the body prepare for a good night’s sleep. The main herbs typically included in chai (such as cinnamon, cardamom, ginger, fennel, and black pepper) have a sweetness and spice to them that act as warming carminatives helping to nourish healthy digestion. These herbs also have antimicrobial properties, helping to fight off infection. Antioxidant rich rooibos is a happy addition to this recipe. It has a wonderful, delightful light flavor reminiscent of honey and a beautiful red color. 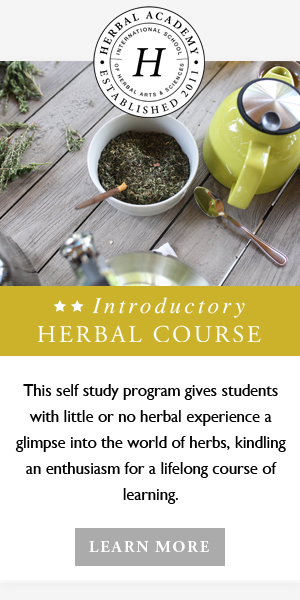 You can add other herbs to your brew to make it even more nourishing. Astragalus, lycium berries, calendula blossoms, rose hips and petals, and even Echinacea and holy basil are good choices for providing support to the immune, nervous, digestive systems. It is a joy to offer a mug of this herbal chai as a warm welcome home to my children after a long day at school. We enjoy it around the kitchen table as we talk about our day and connect. Count the cardamon pods, cloves, peppercorns, and fennel seeds into a mortar. If your child is around have them help do the counting. The is especially fun for young kiddos. Crush the herbs with the pestle, this is also fun for little kids to do! Then place the all of the crushed herbs, ginger slices, and cinnamon sticks in a covered pot along with the water. With the lid slightly askew on top of the pot to allow for some evaporation, simmer the herbs in the water for 15 to 20 minutes being careful not to boil your tea. Remove from the heat and add the rooibos. Steep for another 5 minutes. Strain the herbs out of the tea, rinse out your pot and put the tea back into the pot. Add the milk and honey to taste. Gently warm until steamy hot. Pour into mugs and enjoy! Keep leftovers refrigerated and enjoy within a few days. This herbal chai is also delicious cooled and served over ice! If you enjoyed this herbal chai recipe you may enjoy our other tasty warming family-friendly drinks Real Peppermint Hot Cacao and Golden Milk With A Spin! Angela helps welcome students and answers questions as the Student Services Coordinator and contributes to the Academy blog. Find her writing also at MamaRosemary.com.